"Our settlement was more than we thought was even possible"
Our client was not necessarily looking for a big settlement amount after being involved in a car accident. But after hiring the attorneys at Davis Law Group, she unexpectedly got a nice settlement check at the conclusion of the case. The statute of limitations was coming really close and we weren't going to contact an attorney at all because we thought, "why have it be a bigger issue than it needs to be?" We could just settle it and be done. It kind of just kept dragging on and dragging on and they wouldn't return phone calls and it was hard to get in contact with them. When they would return phone calls, it was always, "OK, get everything together and we'll get back to you." Months would go on and we'd never hear from them. You really don't know what to do next. The closer it got to the statute of limitations and they weren't settling it and they weren't closing the claim, we wouldn't have time then to go to an attorney and have them help us out in closing it. 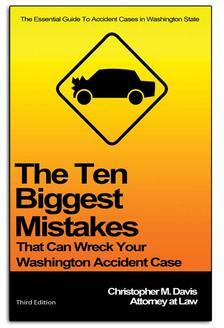 I actually order one of Chris Davis' books, the 10 things not to do when you're in an accident, and that made me decide that, "Oh, I can call an attorney and this is something I could get help with from an attorney." And it's OK to even ask for just consent and further guidance on what to do next. Within a matter of a couple months it was settled and the case was closed and everything's good now. As soon as they'd be willing to take my case I heard right back from them in email. Within a week they scheduled to meet with me and they always kept me updated on where we were in the claim and what was happening and what they were gathering. I always got copies of everything. I was always well informed and I never had any questions that went unanswered. We didn't really expect any settlement funds at all. We just wanted to close it and move on because accidents happen and we understand that. We more or less just wanted to move on with everything, and the fact that we did get a settlement, I didn't know that was possible. We didn't think we'd get any funding or anything from it.